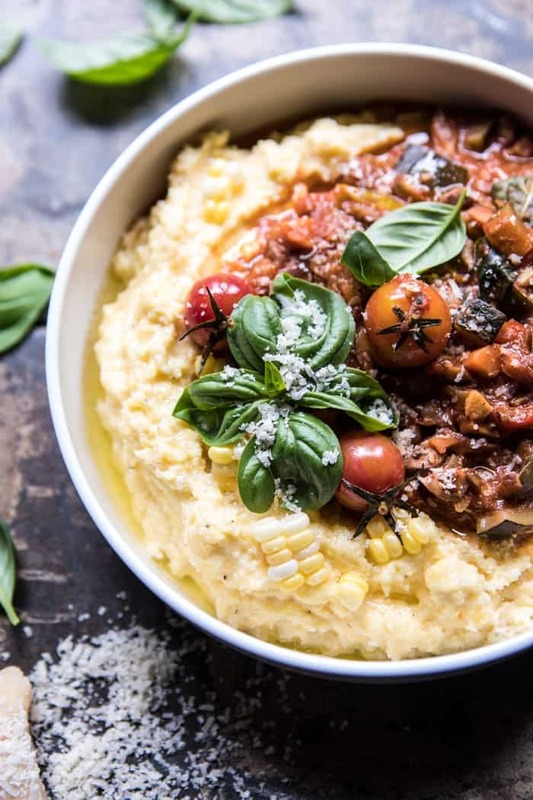 Late Summer Vegetable Bolognese with Creamy Polenta. 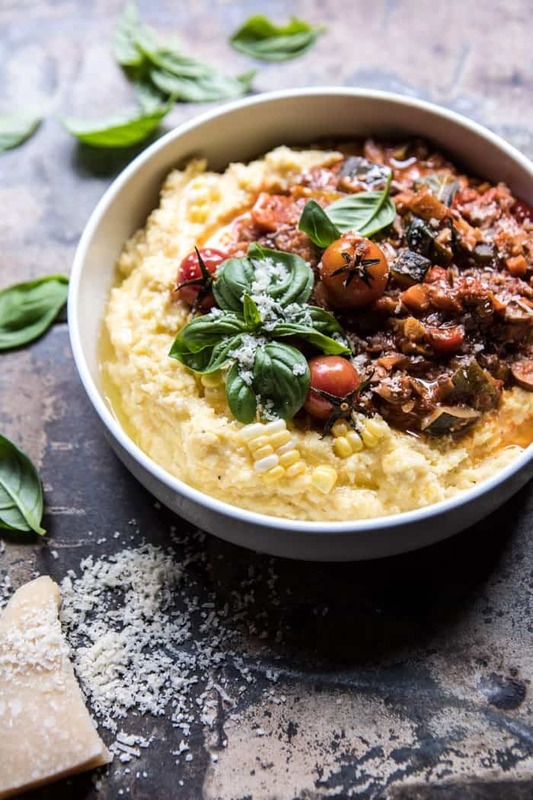 Exciting things going on here today, and they all start off with this late summer vegetable Bolognese with creamy polenta. Yep, three very exiting things to share today. Exciting thing number one! Today is little (or maybe not so little anymore) Miss Asher’s 9th birthday! For everyone who may be wondering, Asher is not my daughter. Nope, she is just my little sister, who I am whole heartedly obsessed with. To celebrate her big day my mom and I are surprising her with a girl’s shopping trip. Today is a testing day for her, so she only has to go in to school for 30 minutes, once she’s done we’re heading down to Denver. Asher has suspected nothing yet, so I’m excited to see her face. She already had a party when my family was in Cleveland, so I don’t think she’s expecting much today. I love surprising her! Follow along on Instagram stories. Exciting thing number two! We have a very fun post up on the blog today involving the Half Baked Harvest Cookbook and an all expenses paid trip out to visit my little Barn in Colorado for a HBH retreat weekend this September. If you have yet to see the post, you can find all the info here. And guys, I would be sure to check it out, it’s a pretty big giveaway and will be an incredibly fun weekend trip too! Umm, hello to a dinner cooked by me, cheese board making, and so much more. Exciting thing number three! 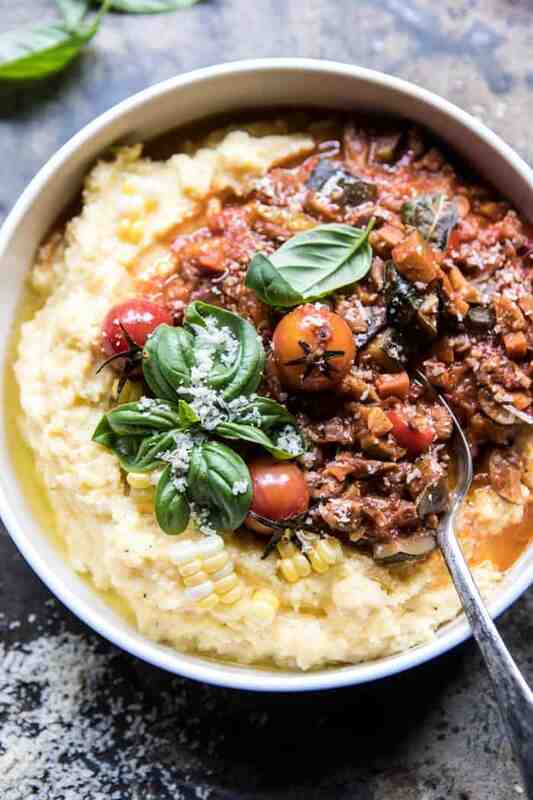 Umm, duh, this yummy vegetarian Bolognese served over creamy corn polenta! Now do you see where I am coming from? So many things to be excited about today!! Loving today already! OKAY. Since I can’t ramble on about Asher’s birthday all day (although I probably could…), and the retreat has its very own post (go check it out! 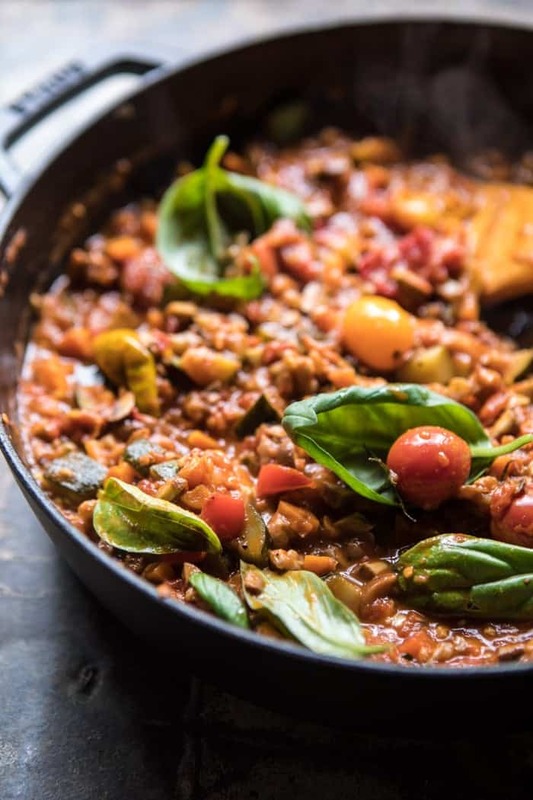 ), let’s talk about today’s recipe, which is just as exciting to me because I love this healthy Bolognese SO much. I have been working on this recipe for a while now. At first it started out as a beef Bolognese, but for some reason I was just never overly happy with the recipe. I took a break from it for a week and then picked it back up again last week, but with a new approach. Instead of making a meaty Bolognese sauce, I decided to opt out of the meat all together and just use up all the summer produce in my fridge. And you know what happened? I ending up loving the recipe. If you read the blog regularly, then you know I love veggies, but you also know my family loves meat. Sometimes it’s hard to find a compromise, but with this recipe, I found the comprise, just make the veggies taste so good that no one misses the meat (okay, okay and disguise them really well in a red sauce). Oh, and then serve it over a pile of polenta for extra goodness. This recipe fooled pretty much everyone. I sent all the leftovers over to my parent’s house. I got a text later that night asking what kind of meat I had used in the sauce. My dad was shocked when I told him it was all veggies. He said he would have never guessed because there was so much flavor and texture. Both he, my mom, and my siblings that were home at the time (hey, hey to Brendan and Lyndsie) loved the sauce. YES! I love when I can trick the family into eating a completely plant-based meal. The sauce is made up of some of my favorite vegetables: carrots, bell peppers, zucchini, mushrooms, and tomatoes. The carrots and peppers add really nice texture, while the mushrooms give the sauce that meaty flavor. The bonus part of this recipe is that you can really used any mix of vegetables that you love or have on hand. Shredded brussels sprout, cauliflower, and broccoli would all be awesome. You could even stir in some spinach or kale. I also added in some chopped walnuts, which might seem odd, but they bulk up sauce and add a really nice heartiness. For some extra flavor, I added in a splash…or two, of white wine, plus some crushed red pepper for spice. 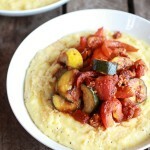 You can of course serve this up over pasta as well, but I love the polenta, it’s different and totally delicious. And finally? Finish the dish off with a healthy dusting of really good parmesan cheese. 1. Heat the olive oil in a large skillet set over medium heat. 2. When the oil shimmers, add the onions and carrots and cook until softened, about 5 minutes. Stir in the zucchini, bell peppers, mushrooms, garlic, and thyme. Season with salt and pepper. Cook for 8-10 minutes or until the veggies are tender. 3. Stir in all of the tomatoes, wine, and 1/2 cup water. Stir in the walnuts. Shimmer the sauce for 20 minutes or until it has thickened and the tomatoes have burst. Season with salt and pepper and then stir in the basil. 4. Meanwhile, make the polenta. In a medium saucepan bring 2 cups of water and the milk to a boil over medium heat. Slowly whisk in the polenta, stirring, until the polenta is soft and thick, about 5 minutes. Stir in the corn and butter until melted. Season with salt and pepper. 5. Ladle the bolognese over the polenta. Enjoy! 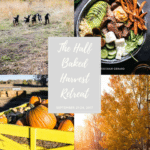 Half Baked Harvest Cookbook: Colorado Retreat Giveaway! 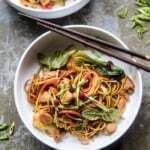 Sweet and Sticky Vegetable Stir Fry. Crockpot Spaghetti Squash Lasagna Bolognese. That looks like something my meat eating household would eat! Thanks for the idea Tieghan! Ah pleasing the meat eaters can be tough!! This would be a great bet for it though!! Thanks! Love that it’s vegetable based and looks relatively simple to make! I’ll have to try it out. Hope you love it Leanne! Its one of my favorites! Beautiful photos as always and look so YUMMY! The definition of Bolognese is a beef sauce. Hence, you can not have a vegetable beef sauce. Same as having tofu bacon! That looks delicious and a nice twist! Thanks Emily hope you like it! This looks wonderful! 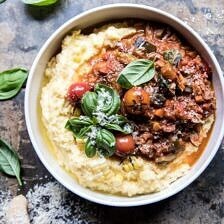 I’m using all my garden veggies and organic polenta for tomorrow nights meal! THANK YOU! YAY! Hope you love it Rose! Thanks so much! We still have loads of veggies left over from our garden and you definitely convinced me to make this for lunch tomorrow. Can’t wait for the cookbook to come out to get some fresh inspiration and loads of great new recipes. Love fresh veggies! Hope you love it Pika! Hope the book brings you tons of inspiration!! Thanks! So excited to give this a try!! I think a spy corn in the picture but not in the recipe ingredients. Do you recommend throwing in the corn as well ? Definitely throw in some corn Sophie, so delicious. There are 2 ears corn, kernels removed, listed in the ingredients for the polenta, the corn adds a really nice texture. This looks really lovely and perfect for my mom whose trying to go peskatarian. 😉 I agree with adding the walnuts and think the sauce with the corn polenta would be lovely! Also, I entered the giveaway 🤗 And I hope Asher had an incredible birthday! Thanks for the sweet comments Kristin, and good luck on the giveaway! Ha ha, so glad that we were thinking alike! And I can’t wait for you to see the book, I hope you love it! Happy Birthday to little Miss Asher! Hope y’all had a fun shopping trip together. Love this end of summer comfort dish Tieghan. What a great vegetarian dish! Aw, thanks so much Mary Ann! 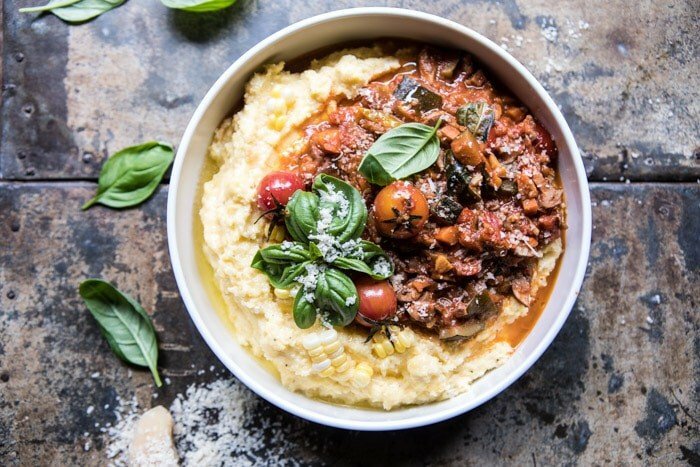 I’ve been itching to make polenta with bolognese but have a non meat eater in my family – problem solved! Thanks Tieghan! Happy bday Asher! Yeah, so glad this will work Maura, hope you love it! Thank you Kirsti! Hope you enjoy the recipe! 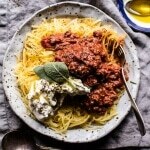 Sounds so good and I love the idea of serving it over polenta! Thank you so much, Leigh! Have a great weekend! Love this veggie comfort dish so much! Thanks Matt! Have a great weekend! This looks too good to pass up. Will be making this weekend as soon as the weather cools off a little here in Cali. Love your website and will definately be purchasing your book. Thank you so much, Rita! Enjoy the recipe and have a great weekend! You had us at “chopped walnuts!” An earthy, satisfying, guest-worthy dish. Cannot wait for your cookbook to drop. Thank you so much, Michael! Hope you love the recipe! Wow! This looks hearty and delicious. Can’t wait to try this recipe! In recipe: 2 cup of milk. Brian you need 2 cups milk and 2 cups water. Sorry if that was confusing. Let me know if you have any other questions. Polenta: in recipe mix milk with water? Yes mix the milk with the water. Made this and it was great. The whole family loved it! First time putting a sauce on polenta. Thank you!! BTW I made it in my instant pot. Thank so much, Tammy! Thrilled you loved the recipe and great idea using the instant pot! Not a silly question! 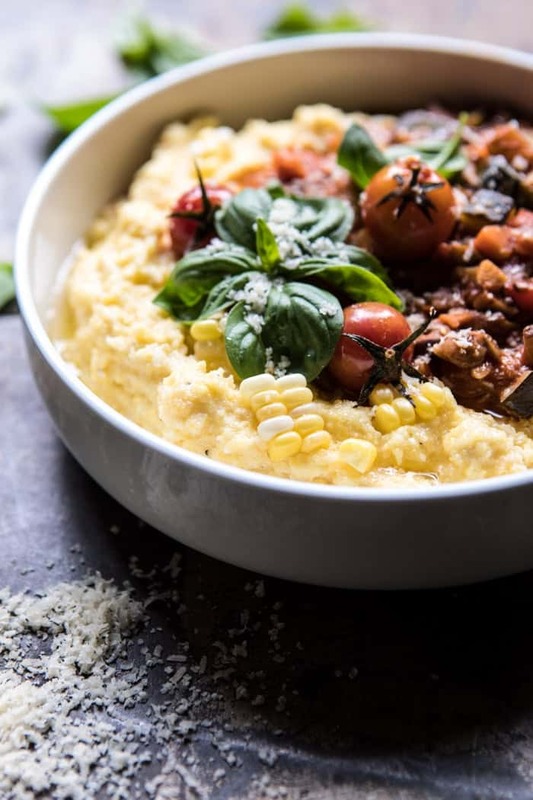 No need to cook the corn, the polenta will warm it up! Hope you love this! 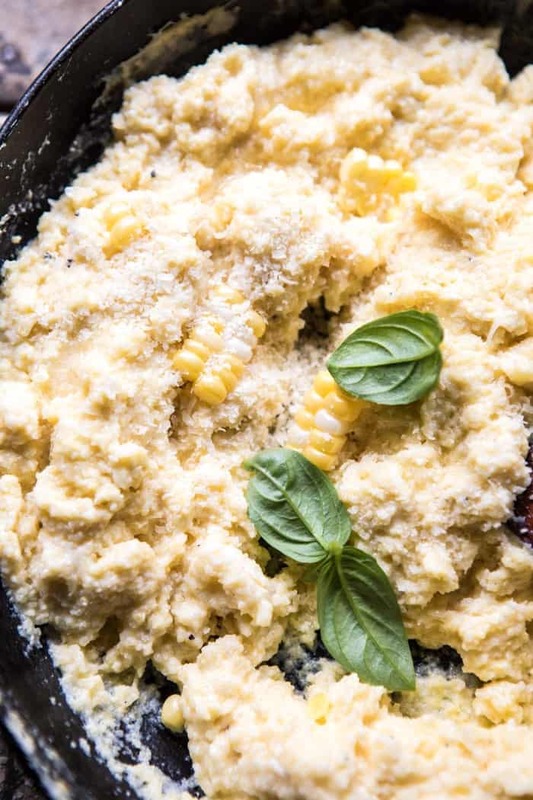 2 questions–do you cook the corn first and is there a difference between “instant polenta” and just corn grits (i.e. Bob’s Red Mill) that you can make polenta out of? Hi Taylor! You don’t need to cook the corn first. Cornmeal will take much longer to cook and I dont recommend using it in place of the instant polenta in this recipe. Hope that helps and please let me know if you have any other questions. Enjoy! Made this for my family tonight and they loved it! I added some bite-sized potatoes I found, and my meat-loving brother added some bratwurst to his. Walnuts were also a great and unique addition! Great recipe! How much crushed red pepper? Recipe does not mention. I just like to use a pinch of crushed red pepper, about 1/2 a teaspoon or so. Hope you love the recipe! This was really wonderful. The walnuts were a really interesting addition and went over so well. Did the polenta a bit more proper though with broth instead of water and I added some parmesan and butter to make it extra rich! Would recommend, Yum! Thank you! I am so glad you enjoyed this! Thank you Ashley! I am so glad you liked this Ashley! Thank you! What size skillet did you use?? I made the recipe as stated and had to use 2 skillets! Made this last night and it was really good. We held ourselves back from thirds and fourths, knowing that we’d have leftovers for another meal. I cooked the corn kernels briefly in a pan of filtered water, then used the water to mix in to the polenta. My polenta was not instant, so I kept adding hot water and stirring to get it creamy. This recipe is definitely a keeper and one for company. Lot of umami from the mushrooms. The walnuts added a nice texture and heft. I am so happy you loved this Caroline! Thank you so much!